Blue PANSY Nappy. Very unusual. PANSY Nappy: Easily recognized in any of its half-dozen shapes, this pattern is given #478 in Imperial catalogs. The Quilted Diamonds exterior pattern lends additional interest to this small piece. With a handle fashioned as a twig, they are scarce in marigold, purple, helios and amber. Smoke nappies are very scarce, as are the blue ones. These nappies were reproduced during the ‘60s & ‘70s in colors of marigold, smoke, helios, white, pink and red. All were made with the IG trademark. 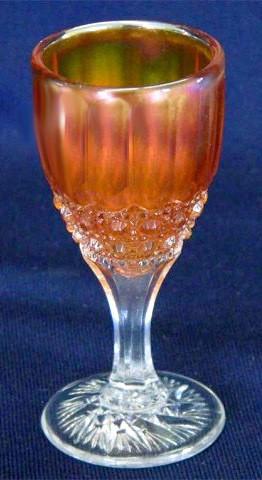 FLUTE and CANE Cordial - 3.5 in. high. FLUTE & CANE Cordial: This tiny cordial is difficult to collect. Apparently few were manufactured, or many of them were broken with use? Several other shapes within this pattern may be seen in our IMPERIAL FLUTE and CANE segment, listed in the left column of our homepage. Marigold WIDE PANEL BULB bowl -7.75 in. diam. Smoke is 10 in. diam. 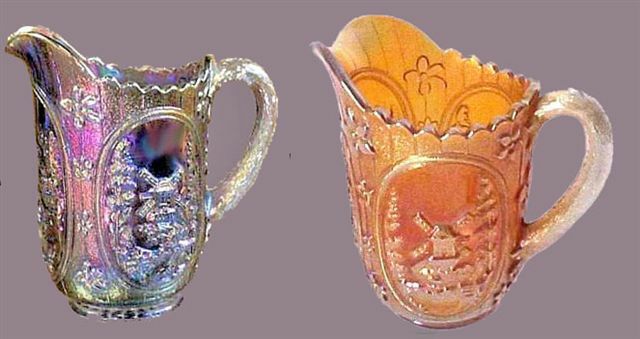 WIDE PANEL Bulb Bowls: The plain marie, type of panels and their shaping, indicate the marigold and smoke bowls to be as stated. Their likeness is repeated in the Mid-Winter 1927 Butler Brothers Wholesale Catalog Ad. 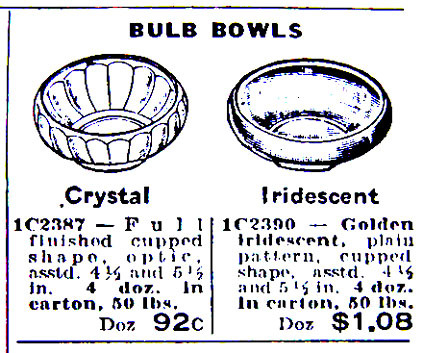 Although bulb bowls are not listed in articles/books surrounding the Wide Panel pattern, we believe they have simply been overlooked in previous research and think you will agree that the time has come to offer them their legitimate status. 16 oz. 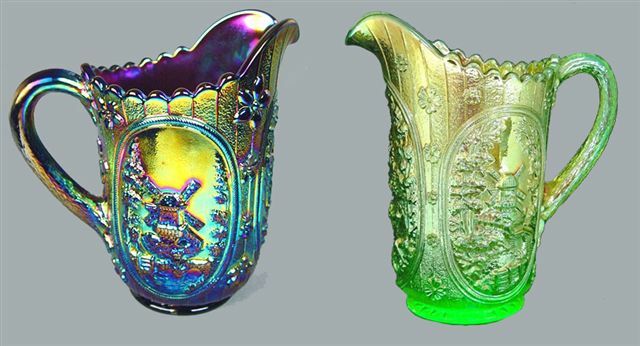 WINDMILL Milk Pitcher, Purple and 8 in. WINDMILL Pitcher, Vaseline. Smoke and Marigold Windmill Milk Pitchers. WINDMILL Milk Pitcher: The 16 oz. size is a bit more difficult to locate than the water pitcher. Marigold is the more prominent color. Smoke and purple are the rare ones. A word about Reproductions: From the early 1960s through the early 1980s, it is safe to say that all of these shapes were reproduced. They were marked with the IG, LIG, or ALIG trademarks. (Bear in mind that since that time, some marks have been ground off and polished by those who would deceive buyers, so “a word to the wise should be sufficient”!) Reproductions were made in marigold, smoke, purple, helios, meadow green, red, aurora jewels (elec. blue); possibly others. Imperial made new water sets, as well. 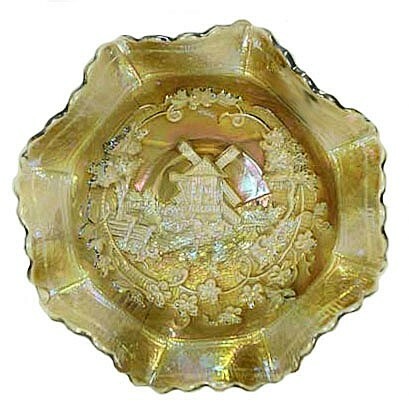 They are marigold with an oval of frosted glass with the windmill panel centered. These were made and marketed in 1966, and again in 1972. 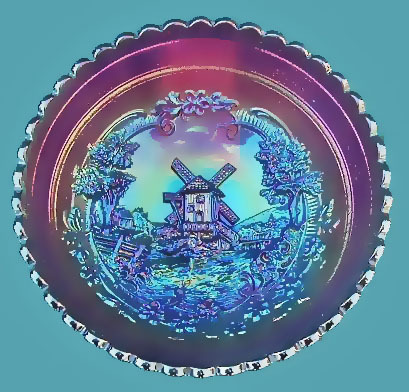 Summit Glass Co. now owns many of the Windmill molds, and their products are on the market. Some of the Summit colors: red, pink, Vaseline, blue and green. The letter S appears in a circle, as their trademark. IC shape purple 8-9 in. Bowl. (collar base). WINDMILL in Smoke - 8 in. (collar base). WINDMILL Bowls: Although footed bowls are known in this pattern, the two displayed here are collar base bowls. Colors known: marigold, purple, helios, emerald, smoke, clambroth, marigold on milk and aqua. There are 4”-5” bowls with collar base: marigold, purple, helios, emerald, and smoke. (IG) WINDMILL Oval Dresser Tray: Colors of known vintage Dresser Trays: marigold, purple, helios, aqua. 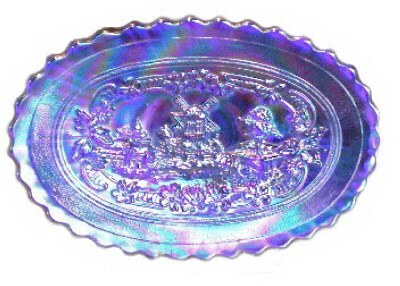 This flat, oval mold was also used to make the oval pickle dish, which, of course has a ruffled edge which turns up slightly. Dresser Trays are quite scarce in any color. Purple examples are scarcely ever found. The (IG) found on this blue tray indicates a reproduction from as early as 1960, extending through the early ‘80s, when virtually all Imperial shapes were reproduced with IG, LIG, or ALIG trademarks. Some of the colors found are marigold, smoke, purple, helios, meadow green, red, aurora jewels (electric blue, such as seen in this dresser tray). SHELL and SAND Ruffled Bowl in Purple - 8.75 in. diameter. 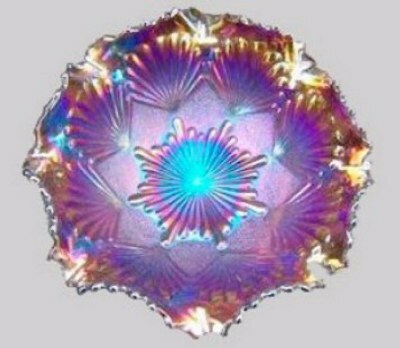 SHELL and SAND Bowl: “Iridescence IS the Essence”! definitely applies to this pattern. 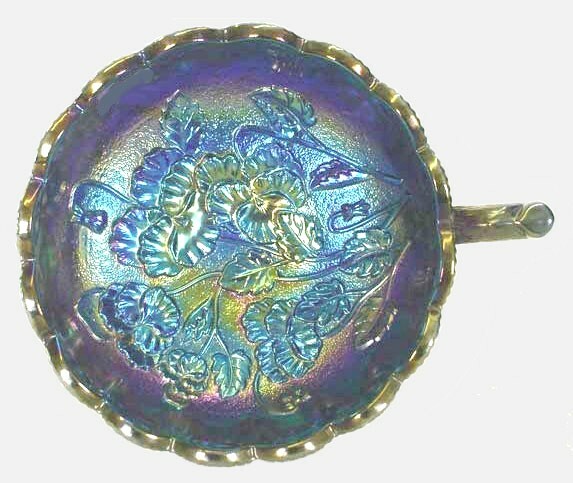 Whether it be Shell (minus the stippling), or Shell and Sand, iridescence is spectacular-plus! 6 ½”-7” bowls are not often seen in either ruffled or ice cream shapes. Marigold, helios and purple are known colors. The 8”-9” bowls can be ruffled or ice cream shape. Colors: Marigold, helios, purple, smoke and amber. SMOOTH RAYS - Purple, Courtesy Robert Hines. Base plate of mould creates inside dome design. SMOOTH RAYS Bowl: Robert Hines discovered this item on eBay, advertised as Westmoreland. Following a consultation with Carl O. Burns, it was decided the bowl was made by Imperial. Although purple has not been a recognized color for that item, the rays are certainly as they appear on the known marigold and clambroth examples. 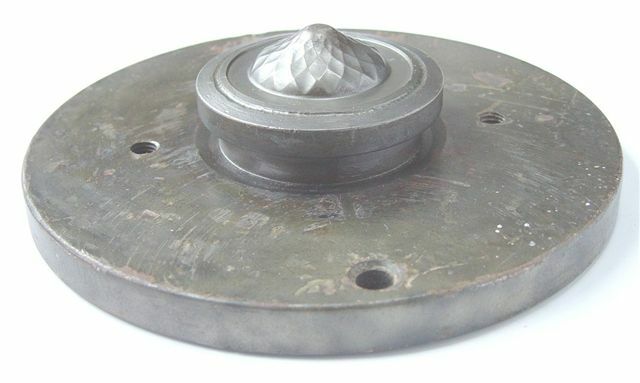 The mould base plate we show only as an example of the method for creating a design within the marie. We display it to illustrate how such design is accomplished. Bowls known in clambroth and marigold are found to have two other variations of starred marie areas. The bowl measures: 8” diam. x 2 ¾” deep. It has a 3” diameter marie. Please refer to our Imperial Smooth Rays segment listed on our homepage for further information surrounding this design.